The latest Fallout sheds the narrative focus of its its single-player predecessor, Fallout 4, and introduces an online multiplayer setup where the human-controlled strangers you meet are supposed fuel a new sort of storytelling. This bold new direction is not without its charms, but its consistently woeful execution leaves it feeling less like a playground of exciting possibilities and more like a graveyard of missed opportunities. 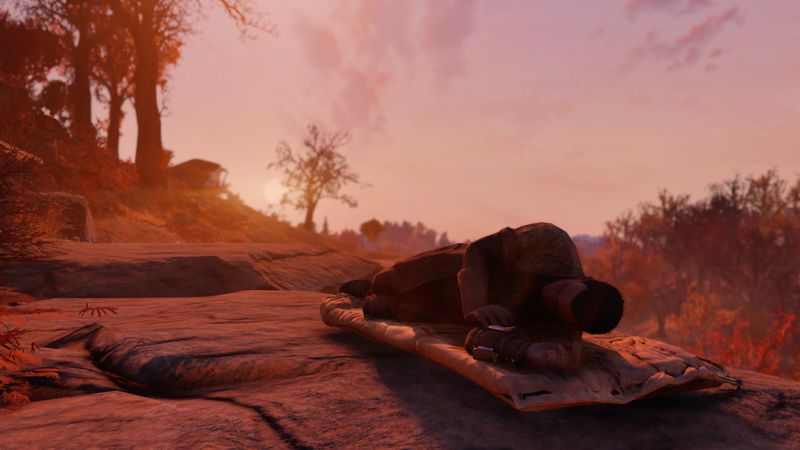 Fallout 76 is not a soulless game, and there have been moments during my over 40 hours with it when its atmospheric beauty and pervading sense of despair profoundly affected me. Yet there have been many more moments during which its insipid quests and tedious item scavenging felt like a time-wasting struggle. BACK OF THE BOX QUOTE: "Country roads, take me... far away from all this." LIKED: Some moving narrative vignettes, evocative landscapes, lovely soundtrack, appealing sense of freedom. DISLIKED: Technical problems on almost every level; overwhelmingly lonesome; frustrating inventory management, perplexing limits on multiplayer interaction. PLAYED: Wandered the wasteland for 43 hours, completing the main Overseer questline and many optional tasks. Have yet to successfully launch a nuclear missile of my own. At dawn and dusk, the light hits the rooftops of an abandoned main street, or hazily reflects through clearing storm clouds. It’s the first Fallout world I’ve wished I could visit myself, to feel my toes squishing through the wet grass, even to breathe in the air. There’s an Edenic quality to its mosaic of mountains, forest, desserts, and marshes that at times recalls Nintendo’s lovely Zelda games. More than once I found myself wondering if maybe it wouldn’t have been better for all of us to have just stayed in the vault and let this beautiful world recover without us. Over a long enough time, Fallout 76’s solitude eventually begins to feel relentless, then immersive, and then ultimately inescapable. 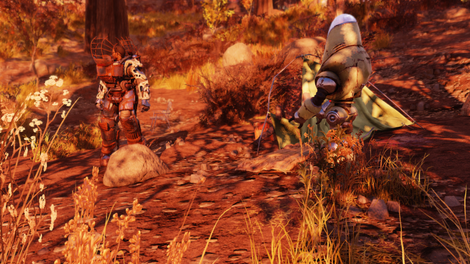 Up to 24 different players at a time can call the same version of Fallout 76’s world home, but there are so few chances for meaningful interaction. Each character is signified as a little white dot on the map. You you can locate one, walk to their location, and proceed to talk, trade, team up, or fight. That’s pretty much it. Once someone teamed up with me, and we carved through waves of enemies together. Afterwards, they gifted me a number of stimpacks and fusion cores, an act so generous I felt somewhat ashamed accepting. Another time, two players dressed in raider gear found me while I was picking berries for a quest. They tried to initiate a player-versus-player (PvP) fight with me, something I would have to agree to before either of us could damage the other. I wasn’t interested, but they continued following and harassing me no matter where I went on the map until I finally logged off. 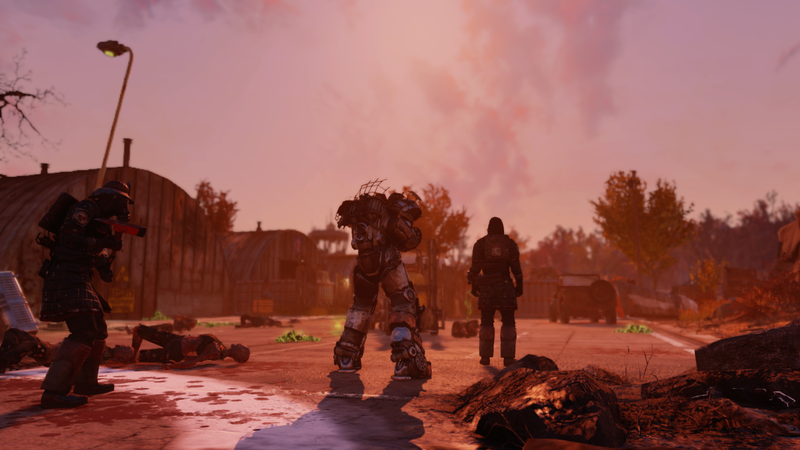 Those two stories pretty much capture the limited range of player-authored drama for which Fallout 76 sets the stage, at least when it comes to interacting with strangers. The game can be played with friends, whether you both want to do the same thing or simply be teamed up while otherwise exploring completely different parts of the map. 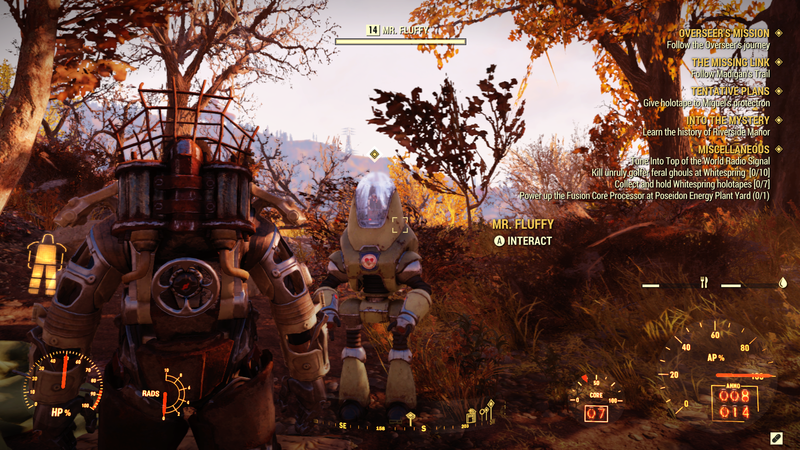 I actually found Fallout 76’s co-op to be one of the more seamless features in game, even if in the end I used it only rarely, instead opting to spend most of my time with the game adventuring by myself. 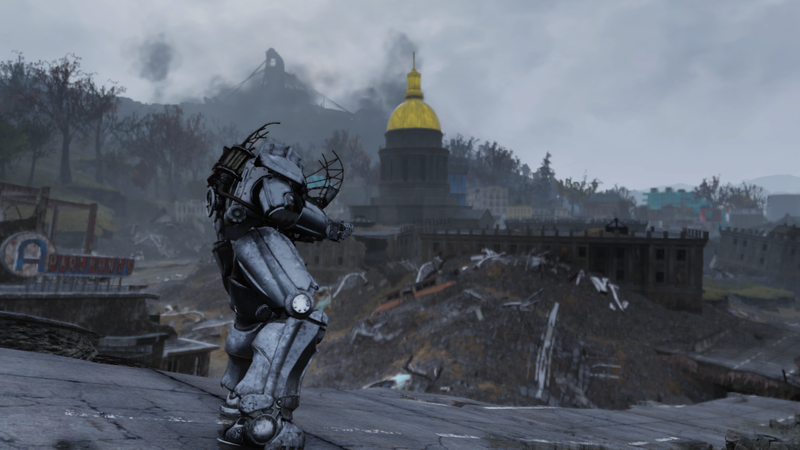 Most of Fallout 76 revolves around journeying into unknown places in order to find weapons and scrap, which you can use to get more powerful, after which you can go into even more dangerous areas. As you explore and kill monsters you’ll level up, using a simple and streamlined levelling system that allows you to adapt your character’s skills as you play. V.A.T.S. (Vault-Tec Assisted Targeting System) returns, but no longer freezes time. It acts as a temporary aimbot instead, which can still be useful, but only when it’s working correctly, which feels like almost never. Your starting point of Vault 76 is located roughly in the centre of the map, after which you’ll branch outward, exploring nearby towns and abandoned ski lodges before finally encountering the state capital. Eventually you’ll find volcanic mines, extensive flatlands, and fissures in the earth, which are home to dreaded Scorchbeasts. In each of those places you can pick up scads of random objects strewn about—glass bottles, coffee pots, animal bones—each of which can be broken down into the basic materials from which everything else in the game can be crafted. You can build guns, explosives, melee weapons, armour, and even structures for your campsite, which is your eminently upgradable refuge in the post-apocalyptic wilderness. My camp stash allows me to store huge amounts of scavenged stuff, but I still spent far too much time in Fallout 76 anxiously trying to optimise my inventory. Everything weighs something. Even the bobby pins take up precious space. The hardest choices I’ve had to make in Fallout 76 weren’t about killing or saving people in the wastes, they were about whether or not to scrap that rare weapon I just found or to abandon an extra set of Power Armor I’d been trying to complete. It also might temporarily disappear altogether. 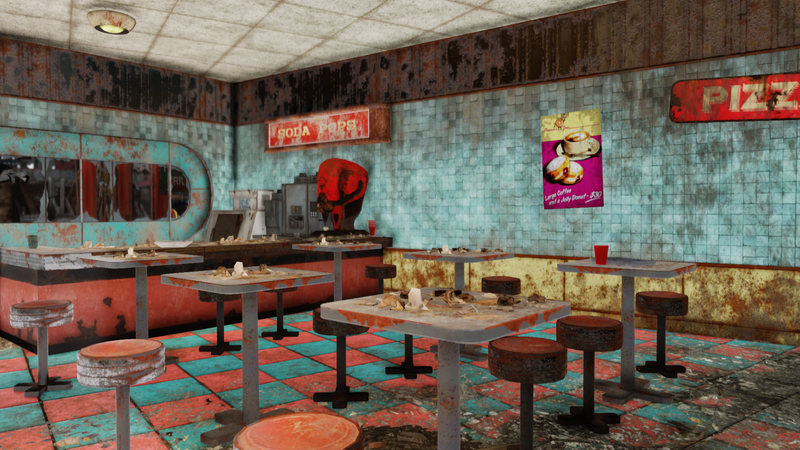 Each time you log on to Fallout 76 you’re put on a random server, and if you ever log onto a server where the position of your camp on the map overlaps with that of another player, one of you will find their camp broken apart and stored away back within their C.A.M.P. device. Each individual fragment can be placed back down again without needing to spend new resources, but hardly ever in the correct arrangement, and sometimes not at all. I’ve had the blueprints for more than one stored camp structure disappear altogether. Camps are mobile, and moving them around can be useful for a number of logistical reasons. Moving camps is similarly destructive, however, which, along with the likelihood of logging on and immediately needing to rebuild, incentivises keeping things as bare bones as possible. Some of Fallout 76’s camp problems could be fixed in future game updates. But even if they were, the underlying problem would remain: you can’t work together with other people in this game. Not really, anyway. Logging onto a new random server every time you load in means anything you did outside of your designated quests and personal character progression will be different. Your effect on the world is localised and ephemeral. You might have fun building a campsite alongside some other players, but your work will be undone as soon as you log off. 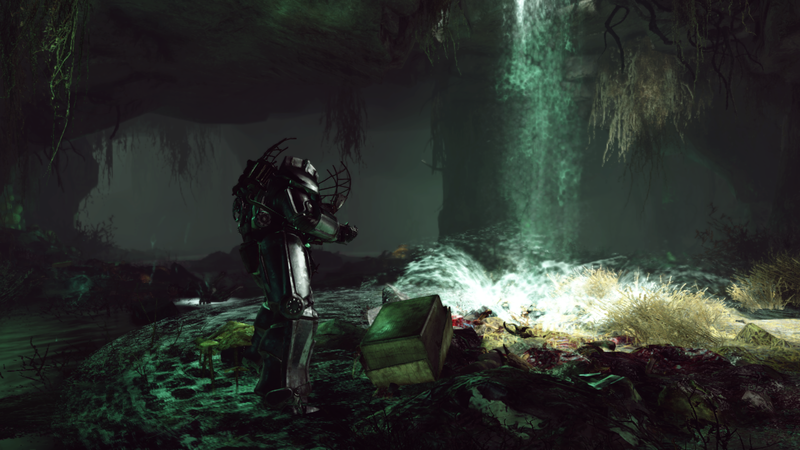 On a technical level, Fallout 76 is often a dismal experience. Just about everything in the game feels unresponsive. Menus scroll slowly, and sometimes require two or three button presses before things start moving. Its assortment of firearms can be satisfying enough to use, in a very crude sort of way, but the survivalist tension dissipates the moment a point blank shot fails to register for no apparent reason. I’ve been cornered in fights with mole miners and rabid dogs only for my melee attack to mysteriously freeze, leaving me defenceless as I wait for the game to figure itself out. Sleeping requires activating a separate camera mode during which you can still be attacked by enemies, but from which you must enact a drawn-out animation to exit. The acts of scrapping items, crafting new items, and modding existing items are each handled in different menus, requiring you to wait for each to load. Sometimes the load times are so long there’s a little animation. Once I jumped off a ledge, only to land wedged in between a dumpster and a wall. I was unable to get out, which forced me to quit the game and reload. I’m not exaggerating when I say that every one of my play sessions ends with a crash—I haven’t been able to enjoy for a single sustained go at the game without it eventually failing. Sometimes it’ll crash on its own, other times the servers will disconnected. Sometimes it happens just as I’m taking down a legendary enemy. By the time I return to the game, the enemies I’d been fighting have been swapped out with another type altogether and the corpses I’d left unlooted have vanished, all because I’d loaded onto a different server. That’s just a brief sampling of the hidden dangers and obstacles which, even after two large patches, remain ever present in Fallout 76. Before I played Fallout 76, I hadn’t really thought about what draws children to want to make forts. It’s got something to do with separating yourself from the routine, and from the predictability associated with your home, neighbourhood, and community. A fort lets you declare yourself independent. You can make your own rules, and that independence imbues every task, no matter how small, with newfound meaning. You’re living by your own rules, estranged from the natural social order of things. Doing homework or cleaning the dishes is boring drudgery, but pitching a tent or fixing a rope-ladder feels like a divine calling. There are no chores in a fort, only the noble work of survival. It’s you and your friends versus the cold, the rain, and the occasional spider or neighbourhood dog.